Black Diamond, an early season favorite, was released recently. This long running brand continues to chug along year after year with its foilboard cardstock and gem themes. 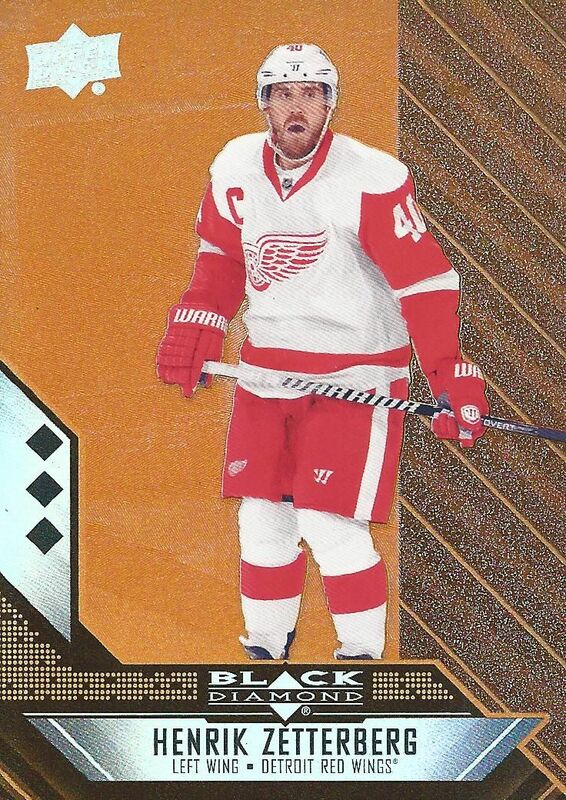 I wonder if Black Diamond will be a rehash of past sets... or if Upper Deck was able to refresh the brand a bit this year. Let's take a look at what a box has to offer. Black Diamond comes at collectors with another version of their all-foil base cards. 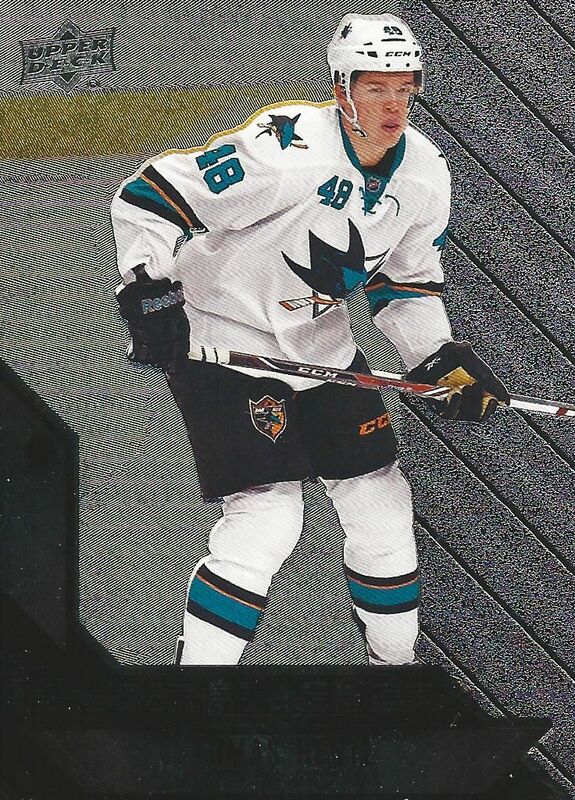 These cards have silver foil in the background with a glossy embossed photo of the player on the front. Having the player remain 'un-foiled' helps them to really stand out on the card. It's an effect that makes it look as if the player is jumping out. 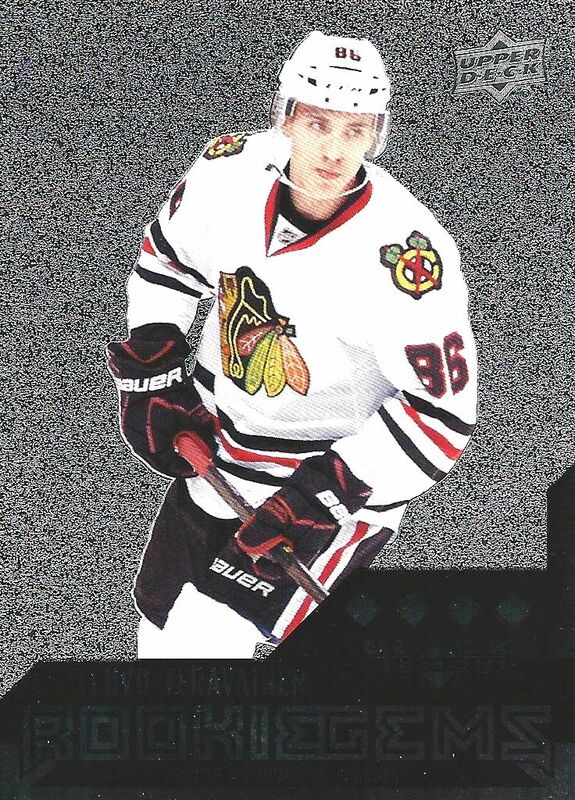 The biggest design element on this year's base card is the large foil area to the player's right. This foil design acts as a very large border on the card, and makes these cards distinct from previous years. I can't say that I really love the Black Diamond design, but it's definitely not hideous. It's just another new Black Diamond base design that joins the ranks of many before it. The back design is pretty simple and straight forward. There are quite a few geometric lines and shapes that adorn the back. It's a design that works, but doesn't stand out to me. It's functional... but that's pretty much it. I would have liked to see much more from the card back. Triple and Quad Diamond Rookie Gems have once again returned in Black Diamond to denote the cards of the rookies. 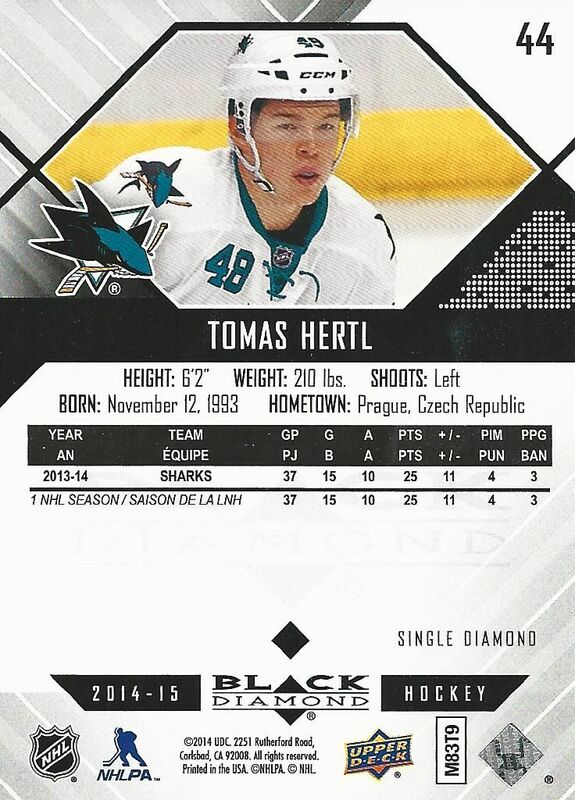 The Rookie Gem design this year is a bit more flashy than in past years, and I would say is much better looking than the standard base card. These cards lose the standard background and replaces it with a patterned design full of glittery looking foil. These cards are certainly flashy and notable - a nice thing to see in Black Diamond! Each box of Black Diamond will come with an assortment of single, double, triple, and quad diamond cards. Though they are all base cards, the higher the diamond level, the more difficult to get. This year's Black Diamond box should yield two jersey cards with other possible inserts and hits. 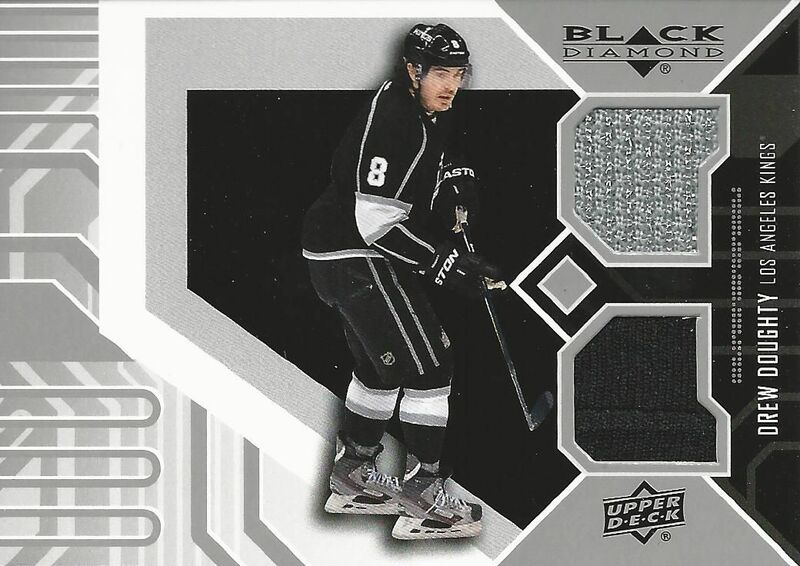 The standard hit in boxes of Black Diamond are the dual jersey puzzle cards. Each card features two swatches of jersey and a piece of a logo or picture. If you collect all the players in a picture, you can put them together and see the design it creates. This concept isn't new. It has been around for the last few years in Black Diamond. When the idea was first released, it was pretty novel... but these jersey cards have definitely gotten a bit long in the tooth. Autographs will occasionally come out of a box, but it's not guaranteed. Black Diamond autographs have always been a bit of a challenge to pull. 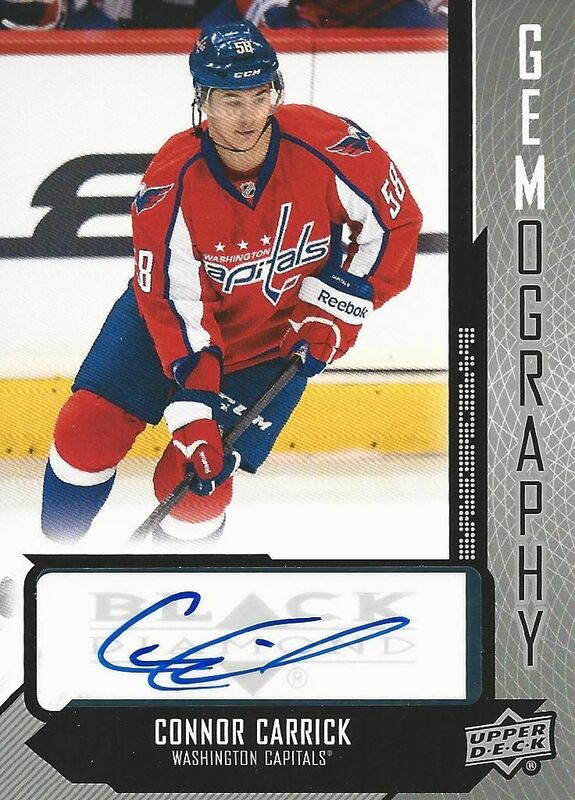 This Gemography autograph continues from a long line of Gemography cards. It is a sticker autograph on a glossy card. Black Diamond also offers base parallel autographs that look much better than these. Speaking of parallels, the red parallels have made their return to Black Diamond. 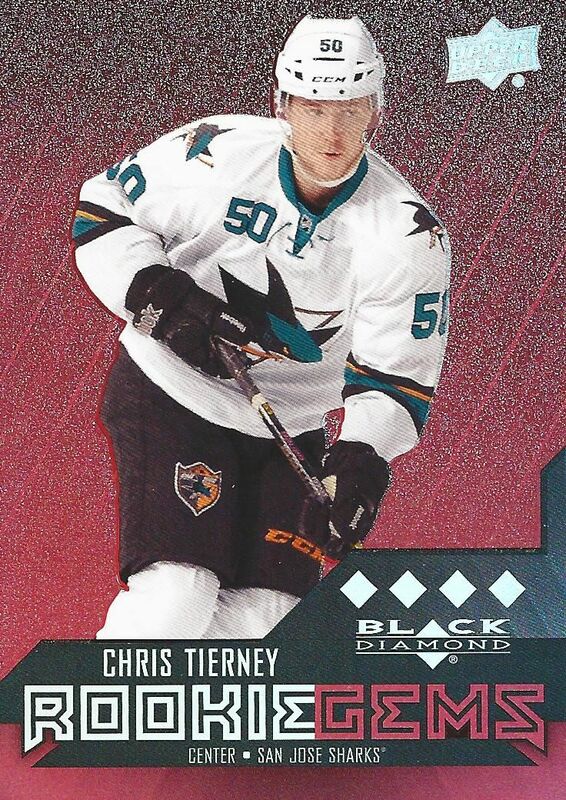 These cards have been in Black Diamond sets for years, and collectors will have to find them to complete their rainbows.This particular red foil parallel of Chris Tierney is nice as the foil has a shimmery look to it. New this year in Black Diamond are bonus packs containing orange parallel cards. Out of all the cards available, I think these are some of the best looking you can find in this product. The orange really stands out in a big way. It would look awesome as an entire set. Other inserts and parallels can also be found in boxes of Black Diamond. The most amazing thing you can find from a box would be a true diamond card one-of-one. Those cards have real diamonds embedded in them. I bet they're amazing to look at! I wish I could say that Black Diamond has a ton of new things to offer with this years release... but I can't. Sure, there's the new bonus pack of awesome orange parallels, but I can see the excitement for these fading pretty quickly. All I can really say is that Black Diamond is Black Diamond. Collectors know exactly what to expect from it. If you've traditionally liked Black Diamond, then by all means dig into this product, but if you've been a bit hesitant about in the past... this year's iteration probably won't change your mind. Sweet product ! So happy that they brought back the red parallel !! Keep it up ! + Great looking colour parallells of the base cards! - The common hits (the puzzle jersey cards and the Gemography autos) are very boring. That's something UD have to improve, maybe by adding the foil effects from the base cards to the hits as well? Nice box: Might have to buy one now! Great Box! Really Enjoyed it! I really like the silver jersey! Nice jersey card pulls! Great review! So many gems in here! Worth mining for! Nice box there! The average Black Diamond box doesn't have that much though (Gemography + quad rookie of terevainen). The base card design looks great though. Same old from black diamond. I do like the added orange parallels and i find all the colour cards look pretty good this year. I've always liked the look of the rookie gems especially the red parallels. The orange parallels look pretty awesome too! I looooooooove Black Diamond. I typically skip over Series 1 & 2 and invest in Black Diamond. I think this season's card look fantastic, they seem to have added a rainbowy shimmer to them, they pop like crazy, like a classic 90s insert. The design is as solid as always, though I agree the jersey cards have had their day, time for a new concept. Hopefully the orange bonus packs mean ICE will be a stand alone product this season. Another 14-15 product worth skipping over.....Might be mid-June before anything half-decent comes out.